SBM YGD series mobile cone crusher plant is equipped with cone crushers with models of CS or HPC and much other equipment. There are now three types of mobile cone crushers, which are YGD8YS75L, YGD10YP16L and YGD10YP22L. For hard materials crushing and also in multi-stage crushing, you can choose our YGD series mobile cone crusher plant. SBM YGD series mobile cone crusher plant is equipped with cone crushers with models of CS or HPC and much other equipment. There are now three types of mobile cone crushers, which are YGD8YS75L, YGD10YP16L and YGD10YP22L. For hard materials crushing and also in multi-stage crushing, you can choose our YGD series mobile cone crusher plant. You can choose the best suitable mobile cone crusher plant according to your crushing application. By choosing the options available, you can modify your mobile cone crushers to accurately suit your crushing application. 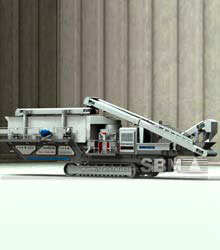 Also, there can be equipped with an on-board screen on the YGD series mobile cone crusher plant. "Thanks to the heavy duty mobile cone for our granite crushing plant."